The ThINKin' Spot: Christmas In July at Peachy Keen Stamps!! Well, at least there's still a little weekend left! I hope that you have enjoyed a wonderful extended weekend celebrating the 4th of July. We've had a great time. From taking our grandsons to the carnival, enjoying some wonderful time with family and yummy food (those two always go hand-in-hand), the fireworks, and just doing what needs to be done here on the farm, it's been a fabulous few days. I haven't gotten in nearly as much crafty time as I would have liked, but I did manage to get this card finished. I colored this image when I was visiting Peachy Keen Headquarters last week, and I chose my color palette just for the Non-Traditional Color Challenge for the Release Party. Here's the card I created using the newly released PK-1328 Yummies stamp set. 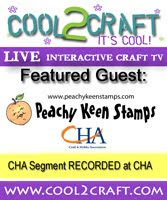 to see what's new and happening at Peachy Keen Stamps! SUPER SALES, a new website launch, and NEW STAMPS! It's all happening this month! CHECK IT OUT!!!! Lorie, this card is so sweet!